Hitachi's technology was able to parallel and perpendicular park a car while the driver kept his hands off the wheel and feet off the pedals. 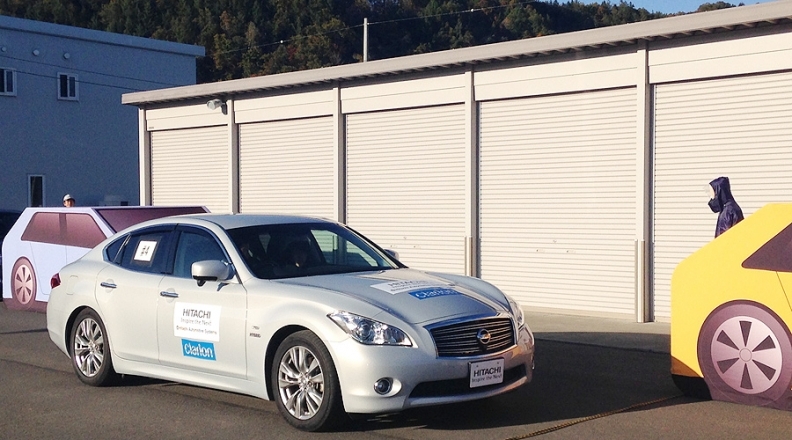 OBIHIRO, Japan -- Hitachi Automotive Systems is readying a suite of new autonomous driving technologies, including a no-hands self-parking function it plans to market in 2016. The systems, unveiled last week at the supplier’s proving ground in northern Japan, entail precrash braking, advanced adaptive cruise control and vehicle stability control for electric vehicles. The technology blitz is part of Hitachi’s push to reposition itself as a top supplier of automotive electronics, the critical underpinning of safety systems in tomorrow’s vehicles. In an interview this summer, CEO Kunihiko Ohnuma said he wanted to transform his Japanese company into the “emperor” of electric and hybrid powertrains. The new systems bundle many of Hitachi’s existing products for enhanced functionality. Hitachi wants to integrate its products into systems that automakers can adopt as a one-size-fits-all package. Key to the marketing will be the ability to sell functions that can be used -- and appreciated -- in everyday driving, not just in emergencies that may never occur. The automatic parking system that Hitachi aims to start producing in 2016, for example, combines four fisheye cameras with Hitachi’s power steering and brake controller technology. During a demonstration, the technology was able to parallel and perpendicular park a car while the driver kept his hands off the wheel and feet off the pedals. It was also able to detect obstacles moving into its path, such as pedestrians, and stop the car until the course was clear. Hitachi said the other technologies will be on sale soon but declined to give a detailed time frame. Executives also did not disclose potential customers. Among the other products is a so-called advanced driver assistance system. It integrates Hitachi’s windshield-mounted stereo camera, four fisheye cameras, a head-up display and engine, steering and braking actuators. Combined, the technologies deliver long-distance vehicle detection and automatic precrash braking before striking obstacles. Hitachi also showed a vectoring control technology that improves cornering under adaptive cruise control. Under typical adaptive cruise control driving, cornering can be abrupt. That can sometimes unnerve drivers, prompting them to hit the brakes and disengage the cruise control. Hitachi’s tweak uses its stereo camera and new software to monitor and calculate steering angle and lateral acceleration. The result is smoother, more stable power heading into curves. The fourth new technology on tap is a vehicle stability control system for EVs that provides limited slip differential and better traction under slippery conditions. Ohnuma’s goal: improve profitability and climb higher in the ranks by focusing on electric technologies, safety systems, fuel-efficient drivetrains and onboard telematics. By doing so, Ohnuma plans to boost Hitachi’s global sales 12 percent to 1 trillion yen ($9.34 billion) in the fiscal year ending March 31, 2016, compared with $8.75 billion in the just ended fiscal year. He also hopes to win more non-Japanese customers. By early 2016, sales to overseas customers should account for 60 percent of global revenue, compared with 53 percent today. Hitachi Automotive ranks No. 20 on the Automotive News list of the top 100 global suppliers.